Place the char siu sauce, soy sauce, honey and chilli jam in a large bowl and mix to combine. Remove 1 cup of the mixture and set aside. Add the pork to the bowl and toss to coat. Refrigerate for 1 hour to marinate. Preheat oven to 180°C (350°F). Place the reserved marinade and the cornflour in a small saucepan over medium heat and cook, stirring, for 2–3 minutes or until thickened. Set aside. Place the pork on a large oven tray lined with non-stick baking paper and cook for 1 hour, turning halfway, or until cooked through and golden. Set aside to cool slightly. Finely chop the pork and place in a large bowl. Add the remaining marinade and mix to combine. To make the dough, place the sugar, water and yeast in a small bowl, mix to combine and set aside for 5 minutes or until foamy. Place the flour and butter in a large bowl, add the yeast mixture and mix to form a dough. Turn out the dough onto a lightly floured surface and knead for 4–5 minutes or until the dough is smooth and elastic. Place the dough in a large, lightly greased bowl, covered with a clean damp tea towel, and set aside in a warm place for 1 hour or until doubled in size. Cut 16 x 8cm squares of non-stick baking paper and divide between 2 large oven trays. Divide the dough into 16 balls. Roll out each on a lightly floured surface to a 10cm round. Place 2 tablespoons of the pork mixture in the centre of each round, and pinch and pleat the edges together to seal+. 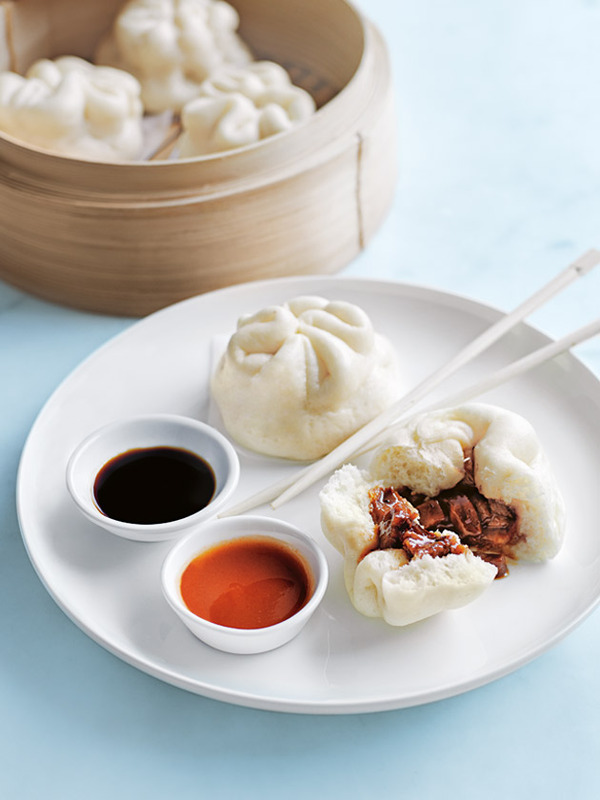 Place 1 bun on each square, cover the trays loosely with a damp tea towel and set aside for 5–10 minutes or until slightly risen.Place the buns, in batches, in a medium bamboo steamer, allowing room to spread. Place the steamer over a medium saucepan filled with simmering water and steam for 12 minutes or until the dough bounces back when pressed. Serve with the chilli sauce and vinegar. Makes 16. + Uncooked pork buns can be frozen between pieces of baking paper for 1–2 months. To cook, defrost the buns and steam following the recipe.